“The Unmarked State” – Laws of Form 50th Anniversary conference. Celebrating the 50th anniversary of the publication of Laws of Form, the seminal book by George Spencer-Brown. Book project & card game with methods to make the time spent in meetings more valuable. Joint project with Kay Liewald and Tanja Wehr. “Form Analysis”, book project on analytical theories and methods to observe social forms and make this knowledge actionable. Based on Laws of Form by George Spencer-Brown. “Das Schlüsselloch der Zukunft? Narrative im Produktmanagement”, Conference Presentation, Working Products Conference 2018, June 29 & 30, Hamburg. “Telling the Right Story: Product Management with Narratives”, Research Paper supporting the conference presentation, Working Products Conference 2018, Hamburg. “Techno, Hip Hop und agile Produktentwicklung”, Conference Presentation, Working Products Conference 2017, Hamburg. “User-Centering Scaled Agile Product Creation”, Research Paper supporting the conference presentation, Working Products Conference 2017, June 22 & 23, Hamburg. “Interfaces for Sound: Representing Material in Pop Music Productions”, Conference Paper, Sound and Music Computing (SMC) Conference 2016, August 31 – September 3, Hamburg. “The Music of Machines: Investigating Culture and Technology in Musical Creativity”, Conference Paper, XIII. Culture and Computer Science, May 29, 2015, Berlin. With Kristina Andersen: “GiantSteps: Semi-Structured Conversations with Musicians”, Proceedings of the 33rd Annual ACM Conference Extended Abstracts on Human Factors in Computing Systems, Seoul, Korea, April 2015. With Kristina Andersen and Peter Knees: “Collaborating with Intelligent Machines: Interfaces for Creative Sound”, Proceedings of the 33rd Annual ACM Conference Extended Abstracts on Human Factors in Computing Systems, Seoul, Korea, April 2015. Workshop “Collaborating with Intelligent Machines: Interfaces for Creative Sound”, CHI Conference 2015, Seoul, Korea, April 2015. Society as Constructed Ontology? Open Peer Commentary, Constructivist Foundations Vol. 10, 2, March 2015. Entropy as a Resource for Double Contingency. Open Peer Commentary, Constructivist Foundations Vol. 10, 1, Special Issue on Second-Order Science, November 2014. Presentation “Jamming with Machines”, 8th Midterm Conference of the European Research Network Sociology of the Arts, Babes-Bolyai University, Cluj-Napoca, Romania, September 4-6, 2014. Panel talk “Giant Steps” at Sónar Festival, Barcelona, June 12, 2014. Discussing research done by the Giant Steps project. 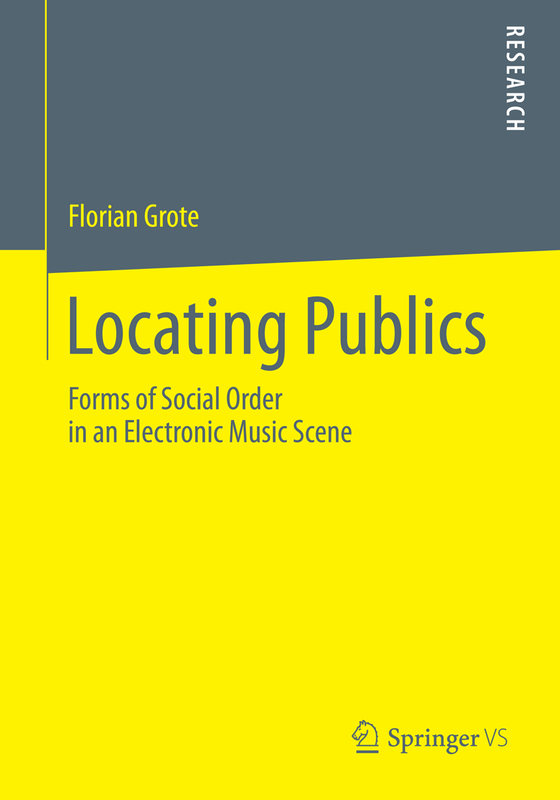 Book publication “Locating Publics: Forms of Social Order in an Electronic Music Scene”, Springer VS, April 2014. Lecture “Locating Publics”, Zeppelin University, January 25, 2013. Presented an overview of my doctoral research project. Lecture “Mediale Öffentlichkeiten von Musikkulturen”, University of Hamburg, January 26, 2012. An overview and discussion of new forms of publics in the light of online communication and distribution media. Re-Synthesizing Theory. A Methodological Feedback Loop, Workshop contribution, Conference “The Methodologies of the System”, Hohenheim University, September 4-6, 2008. Abstract: Investigating a specific theoretical question by empirical means can lead to research processes that closely resemble a feedback loop. Although it may have twists and turns, the details of the theory are both its departing and its destination ground. Like other feedback loops, such research processes require careful tuning of their parameters – the definitions used for the formulation of questions, the contours of codes introduced during analysis, and finally, the condensation of the findings into both textual and visual representations. The workshop contribution will sketch out the research methods currently used during a study that investigates the role of locality and the difference between space and place in the emergence of social order in a specific network of the electronic music scene. Coding social form with Max/MSP, Workshop contribution, Zeppelin University Friedrichshafen, August 13, 2008. Abstract: Max/MSP is a programming environment that was designed for projects in multimedia art. It takes a high-level approach at signal processing and offers intuitive methods to create logical experiments with the ability to easily scale details of the arrangement to empirical needs. The workshop contribution will report from an attempt at modelling the form of the city in its evolution past the introductions of new key media (language, writing, printing, computer), as described in Dirk Baecker’s “Coding Social Form” project. Such an attempt generates a multitude of questions, because to integrate different stages of modelled social order into one coherent process means having to propose meaningful mediations between them. It also involves the experimental implementation of driving forces, counters, and dampening factors as part of the process of operation. The visual representation of the process model attempts to create a topical network view of related Spencer Brown equations. This leads to interesting questions regarding the spatial remapping of indicative spaces of form arrangements onto objects in 3D Euclidean space (and their relations) as used in Max/MSP. The project’s aim is to indicate Eigenforms visually in modelled social processes, which can then be used to describe empirical phenomena and generate leads for further research. Networked Organizations of Music Cultures, Lecture at Netaudio Festival Berlin, October 6, 2007. Abstract: As society continues to process the introduction of the computer, organizations also adapt to its networked potential. Cultural practice has often been on the forefront of such revolutionary social changes, and thus it comes as no surprise that the production and distribution of music as one of the first organizational complexes has undergone the radical shift away from an economy of commodities. On the quest for alternative concepts of organization, the netaudio scene has to establish pioneer knowledge in many fields while dealing with the vastness of linkage possibilities present in its informational surroundings. This paper discusses the rearrangements of social organizations that occur as cultures and economies adapt to the dominance of networked computing in today‘s music scenes. A documentation of 10 experimental interfaces for musical performance with REAKTOR. Supported by Native Instruments, presented to the public on February 8, 2007. Select projects are shown at Ars Electronica Campus 2007. Introducing a unified understanding of spatial order and music, defining both as two different views on the same social entity. Analyzing the concepts of virtuality and reality (and their blurred boundaries) with regard to computer-based music production. Der Konzertsaal im Wohnzimmer. Simulation und Rezeption auditiver Räume. Klang als Schnittstelle – künstlerische Arbeit mit Cello und Pure Data. University of Lüneburg, Summer Term 2004. Hyperkult 14 “Aesthetics and culture of digital audiomedia”, Conference summary, 2005. “Linux as audio platform”, interviews and conference summary of the Linux Audio Developer’s Conference 2005 at ZKM, Karlsruhe.